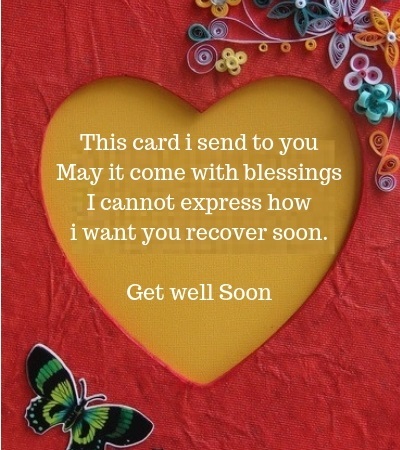 Get Well Soon Text Messages: In life it comes a time when someone we love becomes sick, during this time it’s important to send them get well soon text messages. Nothing is as challenging as having a sick friend or loved one, each time it saddens our hearts to see them so frail. Often we are willing to do anything to help the person feel well. Not only does sending get well soon text messages express our concern to the person it also gives the sick person the courage that all will be well. If you have a sick person and wondering what kind of get well soon message to send to them we have put down some of these messages. You can have a look to get some ideas on what to say. 1. My thoughts are with you, may you get well soon. 3. Sending you these lovely lavender flowers with lots love, let them be a reminder that you are in my thoughts and trusting that you will be getting well soon. 4. Love you my friend, get well soon, I miss you wonderful smile and would do anything to help you get well soon. 6. My dear as the sun rises this wonderful morning, may the healing power of God come down to you. Believe that your pain will go out of our body and that you will rise from that bed to rejoice as the birds of the air do. 5. The most significant thing to always carry in your heart when we are ill is never to lose hope. My heart and prayers are with you during this challenging time. Get well soon. 8. Take heart my friend, I pray that at this time that God’s grace will be sufficient, to embrace when you hardly know what to say or believe. Whatever the doctors say, remember that only God’s word are allowed to be final. 3. Jesus died on the cross that we may be healed and that is why I believe you will be getting well soon. 7. Get well soon, let not worry engulf your heart. Through this hard time God is with you. He says in His word that nothing will separate us from His love. Just know that you are not alone even when it feels like no one cares about you.